Bonfire Brewing will be celebrating their 8th anniversary on Saturday, Nov. 17, beginning at noon. When: Saturday, Nov. 17, beginning at 12 p.m., live music at 7 p.m. and auction bidding beginning at 9 p.m.
Anniversaries are always a special occasion worth celebrating, especially when a business hits eight years. Bonfire Brewing in Eagle is gearing up to do just that. 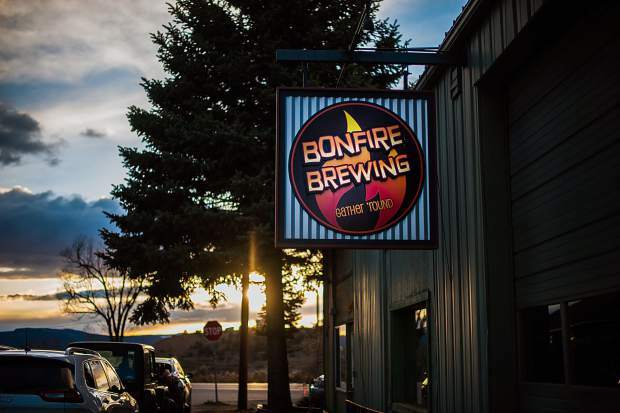 Bonfire Brewing began when Owner and Operators Andy and Amanda Jessen chose to begin brewing beer with Andy’s roommate to avoid finding another roommate, and it has only continued to grow since then. The celebration will take place on Saturday, Nov. 17, beginning when the brewery opens at noon, with live music from Hardscrabble beginning at 7 p.m. and an auction for the mug club beginning at 9. Andy describes the celebration as a “mellow party,” at which, they’ll have 23 beers on tap, including a few that are kept under wraps in order to surprise the attendees. Additionally, the party will feature auctions related to their Mug Club. Club members pay a small fee in order to receive discounted drinks, as well as to receive a custom ceramic stein crafted by Andy’s mother. This year, a brand new, custom mug will be given out. The auction is an opportunity for attendees to move up the waitlist to join the club, which currently has a 10-year waitlist to join. The money from the winning bid will be donated to a charity of the bidder’s choice. In the past, charities awarded have included Vail Mountain Rescue and Bright Future. The bidding will begin as a silent auction, but should a bidding war tie up the potential winners, the event will shift to a live auction. In addition to the large selection of brews and the auction, the anniversary party will serve as a soft opening of the patio space, which Bonfire Brewing will be expanding into by next spring. Amanda also noted that lasting as a brewery for eight years in Colorado puts Bonfire Brewing in an “older generation,” which is worthy of being celebrated. Bonfire Brewing isn’t just stopping with the anniversary celebration, either—they’re looking far beyond that. They’re expecting a garage door installed for patio access in January 2019 and a grand opening of the patio in the spring. They’re also looking at producing more of their crowd-pleasing 10w80 Imperial Stout and their Kilt Dropper Scotch Ale for Christmas. Additionally, the brewery will be throwing a masquerade-themed party on New Year’s Eve.